A few hundred feet below Indian Creek Falls is a much smaller cascade where Indian Creek narrows to just three feet in width forcing the water to churn through the narrow opening between two boulders. The “baby’ falls can be viewed up close from a bridge on the Deep Creek Trail. You can see Indian Creek Falls, Juneywhank Falls, Tom Branch Falls and the baby falls on a short walk through the Deep Creek recreational area of the Great Smoky Mountains National Park, just two miles north of Bryson City. 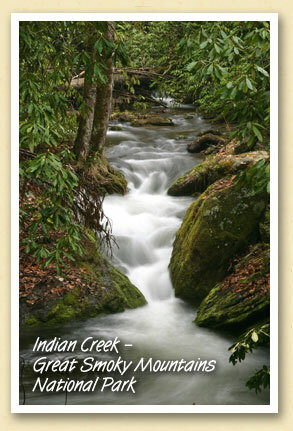 More about waterfalls in the North Carolina Smokies.